Seiko Sportura Aviation And ‘a Sportivo Chronograph Quartz created for a specific use and inspired tools for pilots in the ’70s by the Japanese House. Inspired by a 7T62 caliber, which houses a historical movement in a stainless steel case and black PVD treated with a rotating bezel that allows several logarithmic calculations useful for a helm. A perfect and reliable timepieces for every other kind of measurement, with special regard to the aesthetic: Completed with a soft leather strap, printed or perforated, slightly padded, with yellow stitching to draw the ball and the second largest central timer the smallest time trial, at hour 12. The Seiko watch that has been chosen to celebrate the collaboration with the Barcelona football team. Both have a common origin dating back more than a century ago and the same goal: to reach perfection. 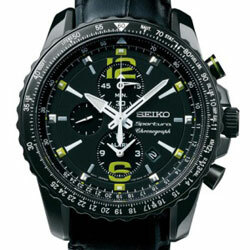 Watches Seiko invented the quartz chronograph in 1983 and for over 50 years measuring the sporting world, an experience that has had all its weight and its importance in the construction of the new Seiko Sportura Aviation: guarantees detection of stroke 1 / 5 of a second, protecting the movement up to 10 atm pressure, with a robust and resistant sapphire crystal which protects it from scratches and abrasions. It ‘also a female declinazone Seiko Sportura seeing Darya Klishina, strong Russian athlete in the long jump, as the face of the clock. A partnership that originated before the World Athletics Championships in 2007 and led Darya to win the world title. By measuring his jump gold Seiko watches were confident that the performance was destined for something great. Yet the Klishina wearing a Seiko Sportura, reflecting his genius and his commitment to perfection. We wish you much success this season marked by the 2013 Olympics and the next when it is still working on winning the world title in Moscow, at home. Seiko watches will be the next to him to measure his every step.